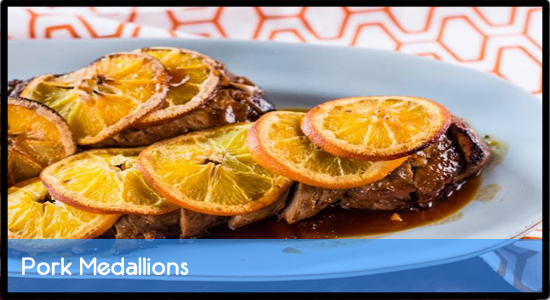 Slice the tenderloins into half-inch thick medallions. Heat oil in a skillet and fry the pork for 2 minutes or until both sides are brown. Remove the pork and in the same skillet, melt the butter.... These yummy pork chops are very easy to make and just plain delicious. They have a lovely blend of spices to flavor the pork and the medallion is wrapped in a slice of bacon for an extra bit of richness. These yummy pork chops are very easy to make and just plain delicious. They have a lovely blend of spices to flavor the pork and the medallion is wrapped in a slice of bacon for an extra bit of richness. Heat a large skillet over medium-high heat. Add oil to pan; swirl to coat. Gently flatten pork slices using the palm of your hand. Sprinkle pork with 1/4 teaspoon salt and 1/4 teaspoon pepper. Mix bread crumbs, garlic powder, salt and freshly ground black pepper. Moisten pork medallions with milk, and coat with bread crumb mixture allowing most of the excess to fall away. Slice the tenderloins into half-inch thick medallions. Heat oil in a skillet and fry the pork for 2 minutes or until both sides are brown. Remove the pork and in the same skillet, melt the butter.